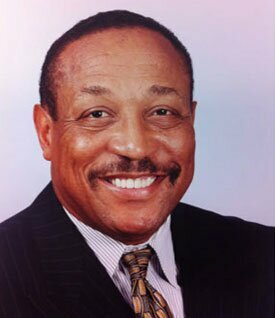 Chuck Ealey is an outstanding football player who overcame racial barriers while excelling at his sport. Born in Portsmouth, Ohio, Mr. Ealey played high-school football, and was a first-string quarterback with the University of Toledo Rockets. He led Toledo to 35 consecutive wins from 1969 to 1971, an NCAA record that still stands. That unbeaten string includes three consecutive Tangerine Bowl victories, with Ealey receiving an MVP award in each. In 1971, Mr. Ealey was named First Team All-American by “Football News,” and he finished eighth in voting for the Heisman Trophy, among many other distinctions. But as an African-American quarterback, he was passed over by the 1972 NFL draft. Undaunted, Mr. Ealey came to Canada in 1972, where he signed with the Hamilton Tiger-Cats. He had a remarkable rookie season, leading his team to first place in the East and earning a CFL’s Most Outstanding Rookie award, and becoming the first Black quarterback to lead his team to a Grey Cup victory — at the same time picking up a Grey Cup Most Valuable Player award. Subsequently, Mr. Ealey played with the Winnipeg Blue Bombers and the Toronto Argonauts. In total, he played seven seasons with three CFL teams, passing for 13,326 yards and 82 touchdowns. He is featured in the book “Choice of Colours: The Pioneering African-American Quarterback Who Changed the Face of Football”; and the documentary “Undefeated: The Chuck Ealey Story,” which aired on Toledo public television in 2008. The 2012 documentary “The Stone Thrower” tells Mr. Ealey’s remarkable story. Fittingly, that documentary is part of the “Engraved on a Nation” series, produced to celebrate the 100th Grey Cup. A certified financial planner, Mr. Ealey is currently a regional director with Investors Group in Mississauga, Ont. He currently lives in Brampton, Ont., with his wife, three children and four grandchildren.